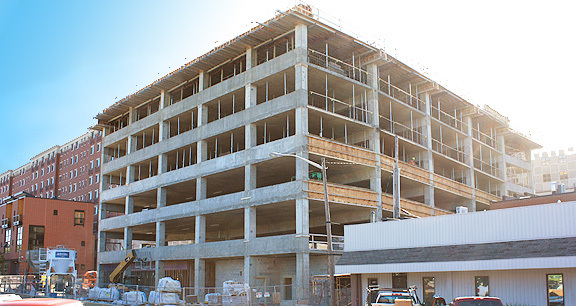 Project obstacles and solutions: The Monroe County Commissioners announced in 2014 plans to build an 800 space parking garage in downtown Bloomington, Indiana. The six-level garage would serve as a primary parking location for city and county employees, plus serve the general public to relieve parking congestion. Hagerman Construction was selected as the general contractor for this project. The six floors of the structure were designed to be reinforced with post-tensioned cables. The concrete for the decks of the garage were specified to reach an early strength of 3,000 psi in 24 hours so the tendons could be stretched. IMI supplied 5,000 yards of concrete for this project. When you are dealing with a lot of concrete that is gaining this kind of early strength, speed of delivery, placement and finishing have to work like clockwork. A challenge on this project was the space restrictions for the pump on the site and trucks delivering to the site. The parking garage was landlocked by an apartment building on the north side, businesses on the east and south sides, and a two-lane downtown street on the west side that remained open during the construction. The large deck pours required that the pump be fed by two trucks continuously. IMI drivers, dispatch and plant personnel worked with Hagerman site supervisors to make sure trucks were spaced out so there was no break in the flow of concrete, but kept the congested area clear of excess trucks in waiting. This critical timing of getting a truck there just in time helped keep this project on schedule. For more information on early strength in concrete, or to discuss delivery methods, contact the sales representative for the concrete plant nearest your location. Click here.